Last Friday I spent the night in the forest for the first time this year and was joined by my friend Scott who also wrote about this trip on his blog. I finally felt comfortable testing my IT bands on back to back days while also carrying a significantly heavier pack. The results were so good I hiked a third consecutive day with my friends Etienne, Lorenzo, and Tim to Mt. Waterman in Angeles National Forest on Sunday. Feeling no pain during or after these hikes makes me confident that I will be ready to hike the High Sierra Trail at the end of July. 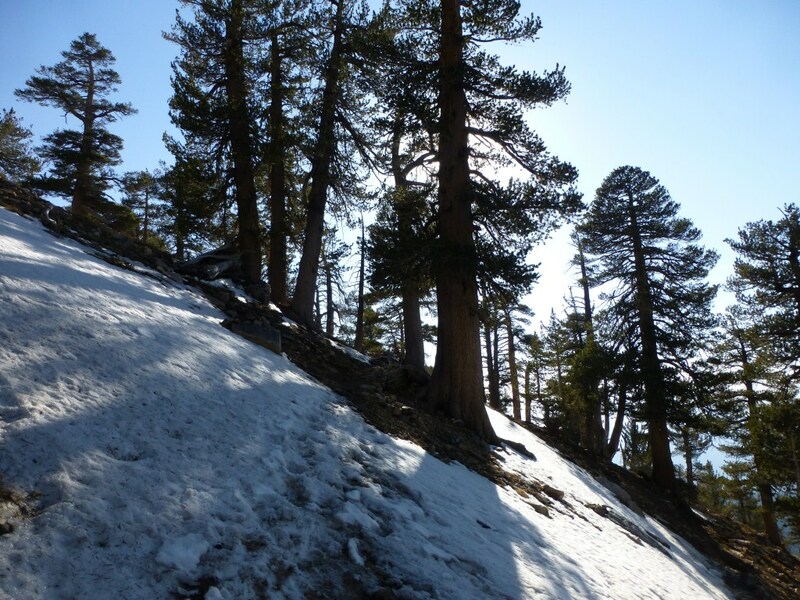 Snow on the trail just above Limber Pine Springs. 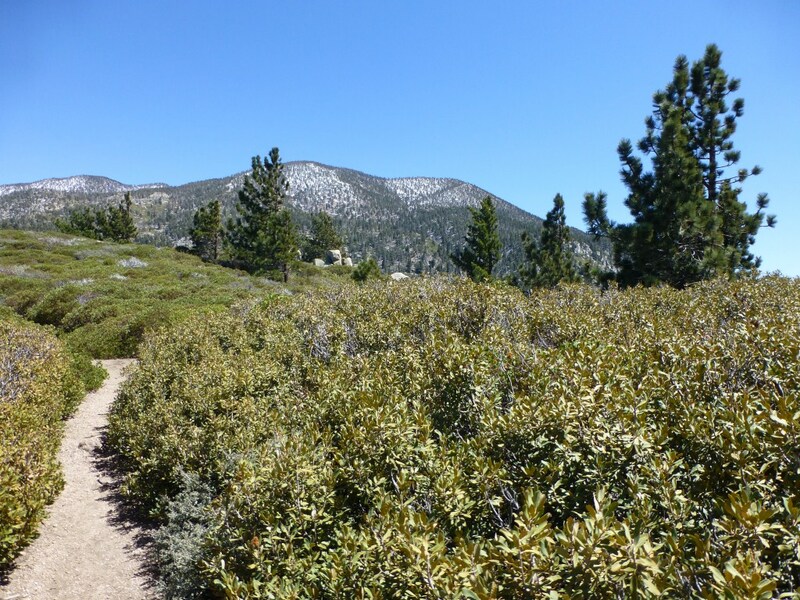 Scott and I started from Angelus Oaks and hiked a portion of the San Bernardino Peak Divide Trail (which crosses nine peaks above 10,500′ ending at Mt. San Gorgonio). I’ve never hiked the entire trail and have been unexpectedly challenged by it each time I’ve hiked a portion of it (August 2012 when I couldn’t complete my planned trip and June 2013 when my trip was made unnecessarily difficult due to misinformation). This year’s challenge involved icy patches of snow on the trail. Since it was so hot all week leading up to our hike, I didn’t think to bring my microspikes. I lose my footing easily on icy snow. Last year I slipped and fell about 30′ down the mountain along the Sky High Trail close to where Thuan Ngoc Pham slipped in the snow and died earlier this year. Slipping (but thankfully not falling) just above Limber Pine Springs and the possibility of needing to return in the dark easily convinced me to play it safe and head back to our campsite at Limber Pine Bench. Scott being more sure footed in snowy conditions than I and a faster hiker (who wasn’t risking a night time return without me along to slow him down) was able to easily make it to West San Bernardino Peak and back before dark. His description and the photo he posted on his blog confirms to me I wouldn’t have enjoyed it had I chosen to continue. 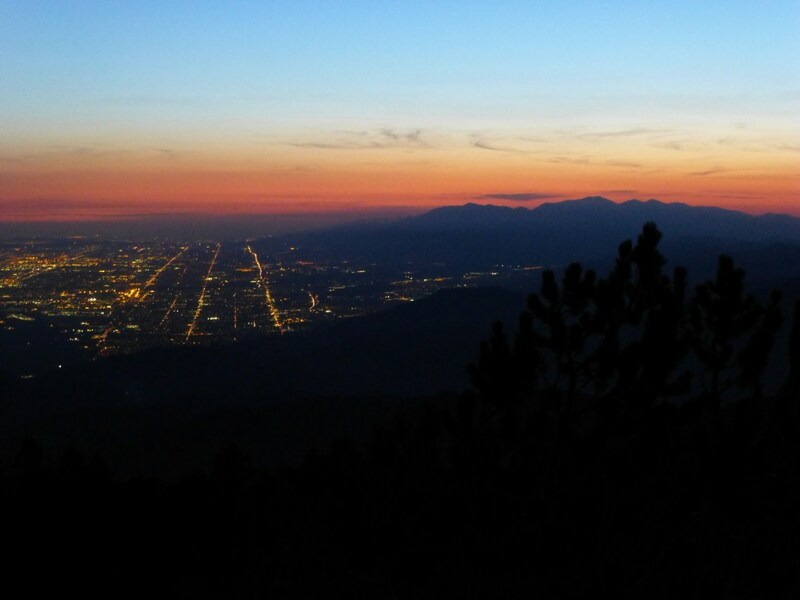 Fortunately, turning back wasn’t that disappointing for me having been to West San Bernardino Peak twice before combined with the fact that Limber Pine Bench is one of my favorite camping spots. While waiting for Scott to return I enjoyed taking pictures there. View toward Mt. Baldy from Limber Pine Bench. Scott returned in time for us to enjoy a nice sunset while eating dinner. My favorite part of sunsets are when the sun disappears from view but still lights up the sky. Dusk is also extra enjoyable for me when there’s an opportunity to watch the lights come on in the city below. 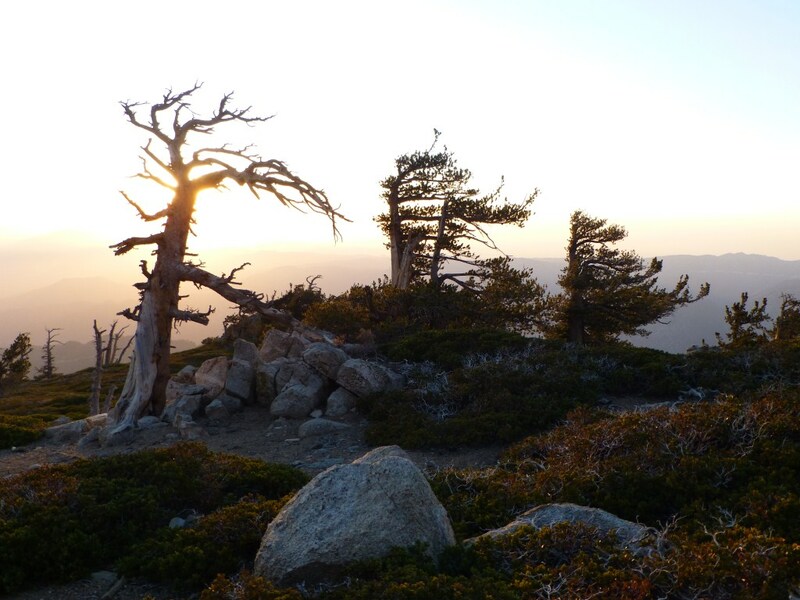 Night setting in at Limber Pine Bench (elevation 9,360′). Although I’ve had my challenges on this trail, it’s one of my all time favorites. I particularly enjoy the diversity of experience as the vegetation and topography changes significantly every couple miles. San Bernardino Peak Divide Trail between Manzanita Springs and Limber Pine Bench. The plateau area west of Manzanita Springs is one of my favorite places to hike because of the expansiveness of views, interesting rock formations, and the gentile slope that serves as a break from the rest of the trail which is considerably more strenuous. Getting out of the heat was an added plus. Eventually, I think I’ll hike the nine peaks. Maybe next year. View from the plateau area of the San Bernardino Peak Divide Trail west of Manzanita Springs. 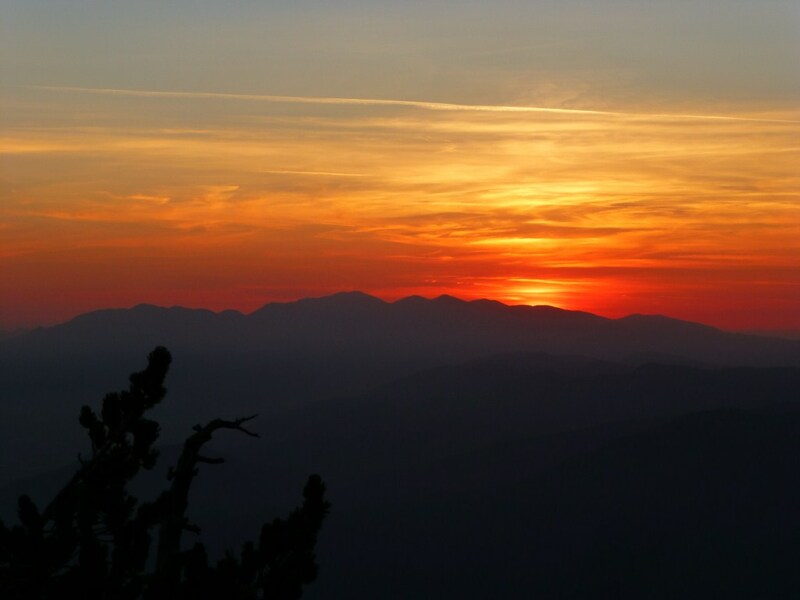 This entry was posted in backpacking, camping, Hiking, Landscape Photography and tagged Limber Pine Bench, San Bernardino National Forest, San Bernardino Peak Divide Trail by Kyle Kuns. Bookmark the permalink. Thanks Denise. The juxtaposition of sitting in the wilderness while viewing city lights is pretty cool. Very much appreciate your posts. 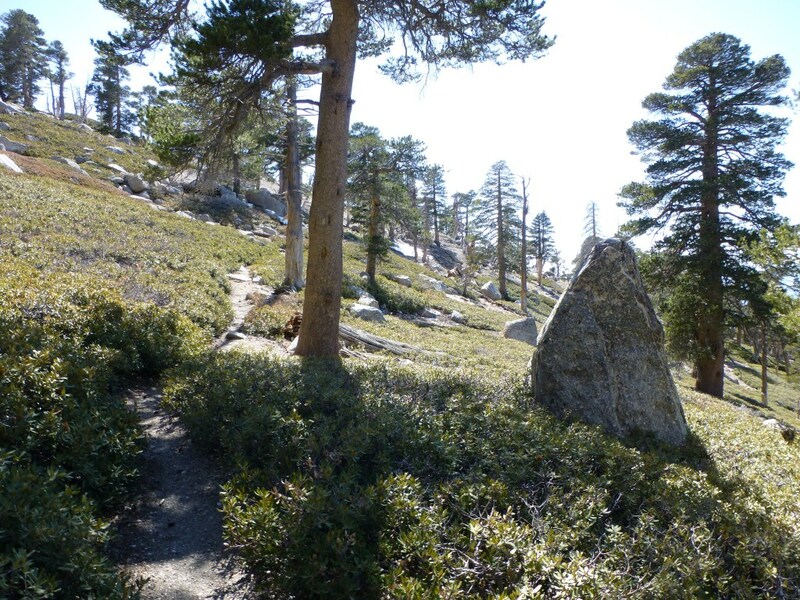 I grew up in the Crest and spent many, many teenage days slogging up and down these trails. Thanks! Glad your back, Kyle. I missed your blog posts. Thanks Jim, I’m hoping to post more regularly now. Waterman looks like a great place to spend the night. Where did you camp? I’ve thought about caching some water earlier in the week and coming back for an overnight. I’m planning to pop by the school at some time, just not sure when yet. Snow in Southern California? What city were you looking down on from your mountain perch? Just curious where this trail is exactly. Rancho Cucamonga, Fontana, San Bernardino, and Redlands are all in view before Mt. Baldy from Limber Pine Bench.